Candler School of Theology hosted world-renowned German theologian Jürgen Moltmann last month for “Unfinished Worlds: Jürgen Moltmann at 90,” a conference focusing on issues of contemporary theology, the contemporary church and the contemporary world. Candler School of Theology hosted world-renowned German theologian Jürgen Moltmann last month for “Unfinished Worlds: Jürgen Moltmann at 90,” a conference focusing on issues of contemporary theology, the contemporary church and the contemporary world, as seen through the lens of Moltmann’s theology. 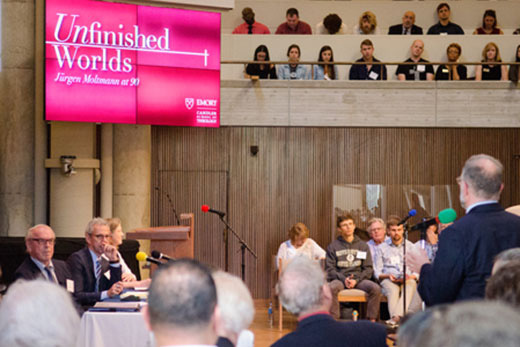 Moltmann bookended the conference with a keynote address and a closing response, and 10 distinguished scholars from around the world addressed subjects of their choice that they believe are “unfinished” in some way. The conference served as a Festschrift of sorts for Moltmann, who served as the Robert W. Woodruff Distinguished Visiting Professor of Systematic Theology at Candler from 1983 to 1993, and has returned regularly since. In his opening remarks, the 90-year-old praised the school, saying it “has always been our academic home in America,” the “our” including his late wife, feminist theologian Elisabeth Moltmann-Wendel, who died in June. In his keynote, “Unfinished Reformation” — with a nod to the upcoming 500th anniversary of the Protestant Reformation in 2017 — Moltmann discussed five major points: the move from a culture of dispute to a culture of dialogue; the unity of the Christian church under what he termed “the papacy of all believers”; the Anabaptists’ stance on the separation of church and state; the importance of celebrating the Lord’s Supper together; and the idea that a reformation of hope follows reformation of faith. Watch Moltmann’s keynote address. Moltmann also said that he has appreciated being part of the debate between two Americas, North America and Latin America, as they struggle with the legacy of colonialism. “Only in America can such lively theological discussions happen. In Germany, we’ve grown indifferent," he said. Finally, Moltmann discussed the importance of the inward life, which he addressed from the perspective of the incarcerated. He was a prisoner for five years total, he said — two years in “the dying German army” and three as a prisoner of war in England and Scotland — and credits that experience with helping him develop a rich spiritual inner world. He touched particularly on the inward life of his friend death-row inmate Kelly Gissendaner, who was a graduate of the theology certificate program at Lee Arrendale State Prison and was executed by the state of Georgia in 2015. “[As she died] she sang ‘Amazing Grace.’ She was the only free person in that prison. And if she can be free, we can be free,” he said. Moltmann ended with this charge: “The sin of the powerful is arrogance. Get out of arrogance and learn humility. The sin of the powerless is apathy. Get out of apathy and live. The sin of the middle class is indifference. Get out of indifference and get involved in the struggle for life. And the Spirit of God will bless you.” Listen to Moltmann’s closing response. “The Future Social Teachings of the Christian Churches"
"We Still Need the Coming of God"
Read summaries of their presentations here.